The population within The Colony’s Retail Trade Area (RTA) has almost tripled in the last 15 years. 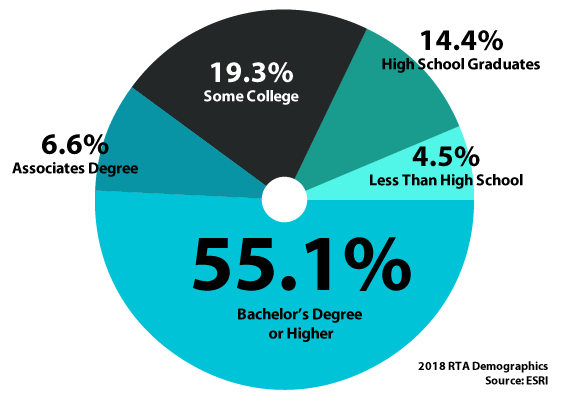 College graduates dominate the make up of our RTA population, at over 50%. We have a vibrant mix of white and blue collar families with a disposable income and ever growing needs for restaurant, retail and entertainment. The Colony has been one of the biggest supporters and partners of The Cascades, a 100-acre master-planned community. Together we are creating a development that will not only provide jobs and revenue, but will also serve as a gathering place for the community. 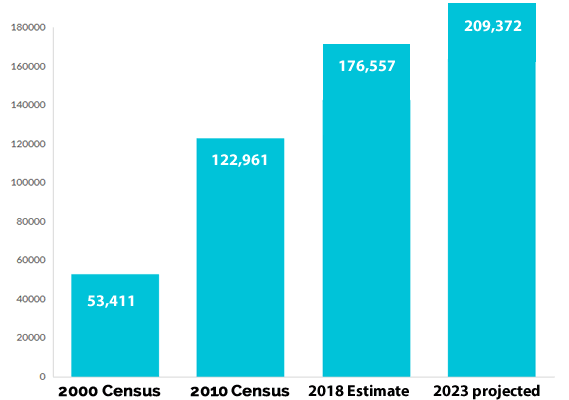 Data supplied by ESRI – January 2019 – Next ESRI data update August 2019. All information furnished is from sources deemed reliable and is submitted subject to errors, omissions, change of terms and/or conditions.